Ducted Air Conditioning: Is Your Thermostat Broken? As we enter summer, the most crucial cooling period of the year, it’s a good time to take a hard look at our air conditioning systems. One of the areas that can cause a lot of problems is the thermostat. We rely on the thermostat to give us accurate readings and to send our required adjustments to the air conditioning unit. If the thermostat is broken, we cannot effectively communicate with our system and our comfort levels and energy efficiency could be compromised. Here are a few things to look out for that may indicate that your thermostat could be broken. The thermostat is a sensitive electrically wired device, it senses the real temperature in your home and makes the necessary adjustments to the air handler. It doesn’t matter if you have a modern digital or a more conventional thermostat, the AC in your home will not work without your thermostat. For this reason, if your AC will not turn on at all, it could be your thermostat that is causing the problem, and it will need to be checked out. If you’re having trouble turning your AC off it could be a thermostat problem that is to blame. The thermostat controls the fan setting for your cooling. If you notice that your home is too cold and colder than the thermostat is indicating you have a problem. It’s likely that the thermostat is not communicating with the blower and running too cold. The first thing to try is to reset the thermostat and try to make some adjustments. If the AC will still not turn off, it will have to be turned off manually, and it’s likely that there is a wiring fault in your thermostat. When you pay for ducted air conditioning cost is an important factor to achieve adequate cooling. When performance is lost, the home is less comfortable and energy efficient. If you notice a loss of cooling in your AC system, the cause could be a clogged air filter. This is simple to fix, but there could be other reasons, such as cracked ductwork, a fault in the blower motor and a broken thermostat. When a thermostat cannot sense the temperature accurately, it will not be able to set the cooling to your requirements. 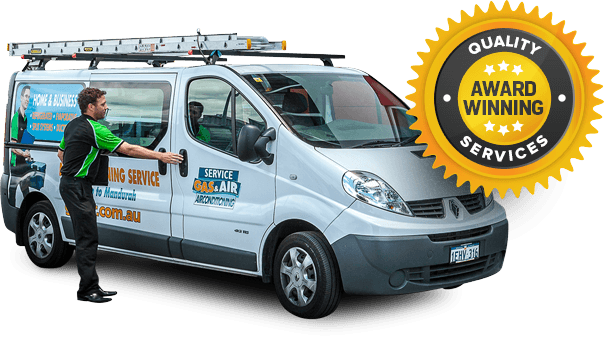 If you need help with your ducted air conditioning system, contact us here at Gas & Air.We supply, install and service a full complement of heating and cooling equipment for both domestic and commercial purposes. Our professional technicians are well trained and take great pride in providing a high quality service at an affordable price. If you need financing, we offer competitive rates with tailored repayment schedules. Our sales team is standing by to advise you on the latest ducted aircon prices and to answer any other queries you may have.